Throughout history, wars have come and gone. Some have been forgotten about while others continue to live on. World War I is one of those wars that will always be remembered. People have an interest in the war because their family members served or because they enjoy learning about history. No matter what your reason, there are many ways that you can feed your interests. Due to the popularity of smartphones and tablets, many people can now enjoy learning about WWI through the use of apps. The following are four of the best apps for more WWI information and entertainment. Learn something new about WWI every day through the use of WWI Daily. With this app, you can scan through a number of different cards, each one containing an important event. Every card contains a date, description of the event and a map that shows where exactly the event took place. You can also access Wikipedia for each entry by â? ?flippingâ? the card over. The deck of cards can be sorted in two different ways. You can either opt to sort it by day and month so you can see a â? ?this day in historyâ? version of the cards, or you can sort them by day, month and year to view the cards in chronological order. To access individual cards, you can use the search function to see only cards that contain your keyword. Wouldnâ? ?t it be nice to have one centralized hub of information to learn everything you possibly could want to know about WWI? Now you can, with the use of Battlefields of WWI. This app contains information for over 157 battles fought during WWI. Each battle contains a description and images as well as a list of commanders. You can access the location using a map feature, and you can also find out exactly how far away the battlefield is from your current location. Thereâ? ?s not much more you can learn about WWI than having your try at fighting during it. 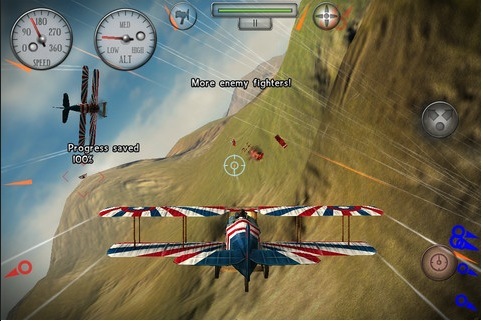 Sky Gamblers: Rise of Glory is a war game app that focuses on aerial combat during WWI. Through this game, you are piloting yourself through the air in one of many different aircrafts used during WWI. You can either opt to play alone, or you can play together with eight other people. You have the option of playing one of the standard games or you can create your own custom mission.Â There are 18 different locations for you to choose from, allowing you to fly through grassy plains or snowy mountains. Plus, you have your choice to fly 10 different (and authentic) WWI planes. If you enjoy playing aerial combat games, Dogfight 1951 is another great WWI app. In this 3D game, you get to enjoy aerial combat with amazing graphics. The 3D imaging in this app give you the feeling that youâ? ?re really in flight, and different weather conditions make the game more exciting and difficult. With your choice of three different games, try to defeat your opponents and conquer your missions before someone else does. So whether you want to learn more about WWI or have fun playing war games that took place in WWI, these four apps are a must-have to your smartphone and tablet collection. Joshua Reynolds loves writing and studying about history and the military.Â He is especially interested in writing about WWI and robotics in the military. I like the look of SkyGamblers! I’m going to check this app out. Dogfights of WW1 are so much more interesting than today’s target the spot on the radar and launch a missile type air wars. You forgot about the biggest and most beloved WW1 game ever. Cinemaware’s Wings. It is going to be released a updated HD version of this game early next year if their kickstarter project is successfull. Please click here to support Cinemaware release the HD version of this great WW1 game.